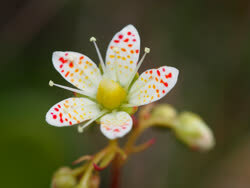 Although other species of saxifrage are found in Europe, this is not the case with Saxifraga tricuspidata. It is found only in North America and Greenland. Kakillarnat means, "It causes a prickly feeling." Or, it can be called tiinnguat, which means, "A substitute for tea." Sometimes it is called a'asaat, which refers to the sound you might make if you were pricked by the plant. Prickly saxifrage leaves can be used to make tea and they can also be put on cuts to help with healing. These plants were used as bedding for sled dog puppies. It was thought that the prickly leaves helped to toughen up the pads on the bottoms of their feet so that when they grew up and helped pull the sleds, their feet would not give them any trouble.